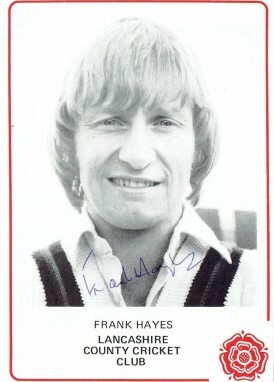 Frank Hayes made his First Class debut for Lancashire back in 1970. He didn’t look too much like a professional cricketer. His blonde hair framed a face that appeared to be much younger than his 23 years, and he didn’t look very different when he retired fourteen summers later, the oldest promising youngster in the business. Born in Preston Hayes’ family moved to Cheshire when he was a child and he proved to be a precocious batting talent, soon becoming the leading batsman in the local team in Marple and at 17 he was playing for Cheshire in the Minor Counties Championship. There were no mighty innings for Cheshire, but his form was enough to ensure that he came onto Lancashire’s radar. Sadly Hayes’s father, who played a key role in his son’s development as a batsman, died in 1963. There had however been discussions about a possible career in professional cricket before Hayes Senior’s passing, and father and son had agreed that a University education would be completed before that opportunity was taken up. For the next five summers therefore Hayes concentrated on his schooling, and then a degree course at Sheffield University in Physics and Mathematics. He played for Lancashire Second XI when the opportunity presented itself, both in the Minor Counties Championship, and the Second Eleven Championship. His returns were steady, but unspectacular. Those destined for great things, particularly as they enter their twenties, tend to dominate at that level so there must have been some doubts in Hayes’ mind when he signed his first professional contract for the summer of 1970. Lancashire had been a sleeping giant for years and in the 1960s virtually a comatose one. Hayes would have watched the changes that took place in the latter part of the decade and no doubt the prospect of playing under the dynamic captaincy of Jack Bond was instrumental in his decision to join the Club full time. Bond placed a premium on high quality fielding. Hayes was no bowler, his entire First Class bowling career consisting of fifty wicketless deliveries of innocuous right arm medium pace. Apparently there was something of a kink in his action as a consequence of which no one ever bothered to try and develop that aspect of his game. In the field however Hayes was like quicksilver, an exceptional run saver amongst a clutch of outstanding fielders on the Lancashire staff. When Hayes began his professional career he had not, in five summers, scored a century for Lancashire seconds. When he finally did it was a big one, an unbeaten 203 against Warwickshire seconds at the end of May. A couple of weeks later he repeated the dose with 112* and 82 when the same opposition visited Old Trafford. His timing was propitious as next day the first team were due to start a Championship match against Middlesex at Old Trafford. Lancashire’s overseas star, Clive Lloyd, was unavailable as he had been chosen to play for the Rest of the World against England in the first “Test” so the county had a vacancy in the middle order. Hayes got the chance to try and fill the biggest, literally and figuratively, shoes in the side. The step up in class for Hayes was huge. The Middlesex attack was led by John Price, an England fast bowler and genuinely quick. The slow bowling was led by Fred Titmus and also featured Harry Latchman, one of the very few leg spinners then plying his trade in the English game. The visitors won the toss and spent the first day compiling a first innings of 344-9 before declaring and nipping out David ‘Bumble’ Lloyd before the close. Next day Hayes came in at 47-4, and ten runs later Harry Pilling left and Lancashire were in disarray. Hayes new partner was fringe player Ken Snellgrove, who he knew well from the second eleven. The pair changed the complexion of the innings as they put on 181 for the sixth wicket before Hayes had a rush of blood to the head and decided to seek to go from 94 to his century in one shot, a lofted drive over mid on. Perhaps the wily Peter Parfitt saw Hayes coming and adjusted pace, line or both accordingly, but unfortunately the ball went down Kevin Jones’ throat rather than over his head. The batsman who replaced Hayes was skipper Bond whose comment as he passed the youngster was, apparently, you’re a daft beggar. Eventually Middlesex left Lancashire a challenging 240 to win. That they got there in 46.3 overs with five wickets to spare was in no small part thanks to a swift 47 from Hayes. Following that victory the Lancashire side, unchanged with Lloyd still away, had the long drive from Manchester to Southampton before starting again the following morning. Bond lost the toss once more but this time Lancashire were less successful as they had to concede a deficit on first innings of 74. Hayes scored just two. Again a run chase ensued. This time the target was 259 in what turned out to be 67 overs. That the Red Rose were ever in a winning position was due almost solely to Hayes who played what one newspaper described as an aggressive innings of amazing maturity. As in the Middlesex match he had cause to feel rueful over his dismissal. He was on 99 at the time and once again it was an experienced spinner who claimed him, this time the Hampshire slow left armer Peter Sainsbury. Looking for another big hit Hayes gave Sainsbury the charge once too often, missed and was comfortably stumped and Lancashire had to settle for a draw. No one could ever accuse Hayes of being selfish. With just the number eleven to come Lancashire needed 28 more in less than three overs. No one would have blamed him if he’d settled for the draw and a personal milestone. The rest of the summer was a slight anti climax after such an auspicious start, but Hayes held his place and played several useful innings. More importantly he did plenty to endear himself to Lancashire supporters, not least by scoring an unbeaten 82 in the Old Trafford Roses match, Bond’s testimonial. The following year’s Wisden commented that the advent of Hayes, one of the most promising young batsmen of the year, clearly indicated trouble for bowlers in the near future. Wisden’s Lancashire correspondent had cause to dwell on Hayes at some length the following year, but not for positive reasons, describing his season as distressing. He began the summer as the man in possession, but a start of 14, 2, 6, 6, 5, and 3* saw him lose his place. Back in the seconds he knuckled down and scored many more runs than he had in his amateur days, but unfortunately for him Snellgrove and John Sullivan both made the most of their opportunities and it was not until the end of the season that he got back in the first team. He did not do a great deal better than at the start of the summer, but Wisden did feel able to say that when he regained his place late in the season Hayes hit the ball hard and looked capable of living up to his reputation as the batting discovery of 1970. At least in 1972 Hayes got his place back, and having done so was virtually ever present for Lancashire in the Championship. That said his summer’s work brought him only 563 runs at less than 30 so not an impressive looking return. Despite that Wisden still described him as one of the most promising young batsman in the game. In Lancashire he remained immensely popular, which just goes to show that if you saved your best First Class innings of the summer for a Roses Match, and then supported Clive Lloyd in the Gillette Cup Final, then you didn’t need to do too much more. What sort of man was Hayes? I don’t recall hearing him being interviewed, and at the time it was assumed by most supporters, given the constant mentions of him being a graduate, that he was a quiet and studious individual. In fact it seems the opposite was probably true. Not many of that Lancashire side have gone into print, the notable exception being David Lloyd, who considered his old teammate as having a God-given talent to bat. Lloyd goes on to describe Hayes as a mixture of professor and nutcase, a mix with which he loved to confuse people. He added that; It was said that he had a vast capacity for drink, and it was said that he was always looking for trouble, and he went on to explain that a dressing room nickname of ‘Fish’ was earned because Hayes drank like one. Having said that however Lloyd went on to compare Hayes to footballer Bryan Robson, in that whilst Hayes played up to the reputation, Lloyd never saw any evidence to justify it. In support of his contention that in truth Hayes was no hellraiser Lloyd reports that he was first to the practice ground in the mornings and often the last to leave, and described him as the fastest and fittest lad in the side. He summed him up as; A good, provocative and always interesting companion. Dull, he was not before going on to tell a story about the disappearance, from a hotel the team were staying at, of a couple of ceremonial swords, their subsequent return and something of the use they were put to in between. If Lloyd’s memory is not playing tricks on him then Hayes was perhaps fortunate it took twenty years for the incident to come to light. In absolute terms Hayes had marginally better summers than that of 1973, but in truth that was his annus mirabilis, the summer that he finally justified the expectations he had created three years previously, and the faith that Wisden and all Lancashire supporters had maintained since then. He began the summer at the end of April with, in his very first innings, his first century for the First team. Cynics would suggest that, coming as it did in the Benson and Hedges Cup against Minor Counties North, that it didn’t really count, but Hayes ran into form. After that first century finally came there were two more in the next two matches as well, and selection for the squad for the third Test against New Zealand. Left out of the side on the morning of the match Hayes did see action for England in the two ODIs and then, after a pair of fifties in the Test Trial he was selected for the first Test of three against West Indies. England lost heavily in the end by 158 runs, but the game was memorable for Hayes and his legion of young Lancastrian supporters. He contributed 16 in the first innings, hitting the last two deliveries of the second day from Inshan Ali for four and six, but it was his second innings performance that really caught the eye. He became the first Lancastrian ever to score a century on Test debut and the thirteenth Englishman overall. His unbeaten 106 stood out like a beacon in a disappointing England innings of 255. Writing in The Cricketer John Woodcock’s view was that; He shows a flair for strokeplay and a quickness of foot which cry out for encouragement. Save for a difficult chance when he was 56 the innings was an unblemished one. The second Test was written off as a ‘bore draw’, West Indies skipper Rohan Kanhai declining the chance to declare his side’s second innings and batting on until a result was out of the question. Hayes got to 29 in the first innings but in the second, coming in at 96-1 with the game over as a spectacle, he did not treat his county teammate Lloyd with sufficient respect. In his younger days the Supercat was a half decent medium pacer and Hayes, before he had even got off the mark, shouldered arms to what appeared to be a harmless delivery, but which cut back in at the last moment to give the umpire an easy lbw decision. The final Test resulted in an innings victory for Kanhai’s men and marked the last act of Ray Illingworth’s Test career. England’s was a disappointing performance, and Hayes, 8 and 0, was as guilty as anyone. He failed in the first of the two ODIs that followed as well, and lost his place for the second, his one consolation being that he had done enough in the First Test to secure a place in the party due to tour West Indies for a return series the following winter under Mike Denness. Wisden’s summary of Hayes’ tour was; The saddest figure on the tour was Hayes, the young man who began this campaign with the prospect of establishing himself as one of the side’s resident middle order batsmen. In the event he scored 60 runs in seven innings, and it can only be hoped that such a wound in a player of such evident skill will not take too long healing. Frustratingly outside the Tests Hayes did pretty well, averaging almost 55, but he couldn’t get going in the big matches. In the first Test Hayes scored 12 and 8. England had a dreadful start, standing at 30-4 after 45 minutes. Hayes batted beautifully with Greig for the rest of the session and then, first ball after the interval, played a none too impressive shot at a none too impressive delivery from Garry Sobers the seamer and was caught at gully. In the second innings he fell victim to Sobers again, but the spinner this time, taking a risk in trying to pull a delivery on a wicket with variable bounce, the resulting bottom edge cannoning into his stumps. It was 10 and 0 for Hayes in the drawn second Test at Sabina Park. It took him 45 minutes to get off the mark in the first innings, not because he was batting poorly, but because of the quality of the bowling. In actual fact he was playing well, but kept picking out the fielders with his shots. The three card trick was performed by Sobers again. When, for the first time, Hayes saw a long hop he carelessly pulled it straight to square leg. In the second innings a moment’s hesitation on his part in answering a call from Dennis Amiss meant he just failed to beat Lloyd’s throw. His luck just wasn’t in and he missed the third Test. Back for the fourth match in Georgetown Hayes had more bad luck when he had a stomach problem. It was feared he may not bat at all, although he felt obliged to. There was one superb shot from Gibb’s off spin, but shortly afterwards the canny veteran persuaded Hayes to drive too early, and he held a fine return catch. Hayes had scored 6. The fifth Test was played in Port of Spain, where two inspired spells of off spin bowling from Tony Greig enabled England to square the series, Hayes’s efforts were 24 and 0. In the first innings he came in at a difficult time towards the end of the first day but batted through a tricky 45 minutes against the new ball. Next day a recurrence of the stomach problem prevented him resuming although he did return before the innings closed. In the second innings he could have no complaint, an off cutter from Bernard Julien trapping him lbw. 1974 saw Hayes make what was to remain the highest score of his career, 187 for Lancashire against the touring Indians but, sadly, there was to be no prompt opportunity to rebuild his damaged confidence, although the selectors did pick him the following year for the squad for the first World Cup. In that competition Hayes got a few runs against New Zealand and a half century against the minnows of East Africa before, like the rest of the England batsmen, he failed in the face of a fine spell of bowling from Gary Gilmour in the semi-final against Australia. The 1976 edition of Wisden, not for the first or last time, had wise words on the subject of Hayes; There were times (in 1975) when Hayes showed a marked lack of concentration; others when he batted so superbly that it seemed he must win back his England place. I recall to this day a vivid demonstration of that. In July of 1975 I went to Blackpool to watch Lancashire play Leicestershire. David Lloyd won the toss and chose to bat. With Barry Wood Bumble put on 47 before Wood was dismissed and Hayes made his way to the middle. I watched Hayes take guard. He was facing that steadiest and most unspectacular of county seamers, Norman McVicker. After having marked his ground Hayes, as some batsmen do, took a little walk before going back to the crease and settling down to face his first delivery. I was at around mid on, and was sorely tempted to shout a warning at Hayes when he stood at least a couple of feet outside leg stump. Of course I wasn’t brave enough to do that and in any event surely an England batsman must have known what he was doing? A moment later I rued my cowardice as I saw Hayes shoulder arms to a straight delivery that hit middle stump. I still think I can be forgiven for concluding that Hayes must have had a plan and couldn’t have just put himself in the wrong place – I am not so sure Bumble can rely on the same defence. For the summer of 1976 the West Indies, led by Lloyd, arrived in England. Captain Greig famously said he would make them grovel, but ended up doing the grovelling at the Oval. Hayes’ form was not brilliant, but was good enough to get him another shot at Test cricket as he was recalled for the third Test. That Old Trafford encounter of the long hot summer has gone down in history because of the bravery shown by John Edrich and Brian Close on the Saturday evening of the match when they negotiated a fearsome display of hostility from the West Indian pace bowlers. Hayes recall is, as a result, long forgotten. He contributed 0 and 18 to England’s defeat by 425 runs, and that after having West Indies at 26-4 on the first morning, and bowling them out for 211. Hayes was out first ball in his first effort, but there was nothing he could have done about it, a good length ball from Roberts leaping at him, catching the shoulder of the bat and looping to Lloyd at gully. In the second innings he toughed it out for an hour and forty minutes before edging Roberts to slip. After his display of courage in the second innings at Old Trafford Hayes was retained for Headingley but, with just 7 and 0, he departed the international arena amidst another England defeat. In the first innings he batted like a man who knew he was on his last life, defending stoically for twenty minutes before getting off the mark. The tension was relieved somewhat when he cut Wayne Daniel to the boundary but then, and I can still remember the groan that almost set the Pendle fault rumbling over the Pennines in Lancashire, he edged a wide one from Daniel to wicketkeeper Deryck Murray. He need not have played it at all. In the second innings Roberts did him with a slow half volley, and that was that. Hayes was philosophical about his bad luck when David Tossell interviewed him in 2006, expressing the view that at least he had an opportunity to play Test cricket, even if all nine of his appearances were against West Indies. Whatever the man himself might say I will always maintain he was unlucky, and that if, after getting that career high of 187 against the 1974 Indians, he had got a berth that summer then he would have settled his nerves, and spent the following winter putting Dennis Lillee and Jeff Thomson to the sword and in doing so would have changed the course of cricket history – a man can dream! For the only time in his career Hayes averaged over 50 for an English summer in 1977. His most notable feat was to almost emulate the great Sobers, who in 1968 took 36 in an over from the luckless Malcolm Nash of Glamorgan. Hayes dropped one just inside the boundary, so only 34 came from Nash’s over to him at Swansea. Hayes’ reward for his season’s work, although in reality he was the only candidate, was the Lancashire captaincy. Thanks to Kerry Packer there was a hope he might get another England call, but it was not to be. He batted well again in the following two summers but, the fine side of the early 1970s breaking up, he could not arrest the slide in the county’s fortunes that had begun after Bond’s retirement. In 1981 the captaincy passed to Clive Lloyd and Hayes began two wretched summers in which a succession of different injuries meant he was rarely available. In 1983 he did manage to play something like a full season and rewarded his admirers with three centuries, one in the Old Trafford Roses match and another, his last, against Derbyshire at Stanley Park in Blackpool. It was by all accounts a batsman’s wicket, but vintage Hayes nonetheless. To my eternal shame and regret I did not attend, the impoverished student in me choosing a day’s work instead. If only I’d known it was the end I would certainly have been there. The end came in 1984. Hayes played in Lancashire’s first game of the season, in the Parks against Oxford University, and scored a modest 11. After that injury struck again and in July it was announced that, on medical advice, the 37 year old had opted to retire. He moved on to a teaching career. His subject was physics, but cricket as well. He began at Felsted School where, amongst others, he coached Nick Knight, and latterly Oakham School, where he helped bring on Stuart Broad.